Members of the Akbayan activist group chant anti-China slogans as they march toward the Chinese consulate during a rally on the South China Sea dispute, in Makati, Metro Manila, in Philippines, July 12, 2018. Two years ago this month China lost a world arbitration court ruling to the Philippines over the legal basis for its maritime claims. Analysts say joint naval exercises by the Philippines and the United States in the South China Sea are an indication the island nation is drawing closer to its former colonizer and historic friend after several years seeking warmer relations with the United States’ cold war foe, China. 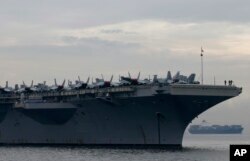 The exercises, July 9-16, include two Philippine warships and two ships, plus an aircraft carrier from the United States, according to the U.S. Navy’s Indo-Pacific Command website. The venue off the west coast of Luzon Island adjoins a tract of the sea where the Philippines and China dispute sovereignty. FILE - Philippine President Rodrigo Duterte gestures while addressing the crowd after leading the flag-raising rites at the 120th Philippine Independence Day celebration at the Emilio Aguinaldo Shrine at Kawit, Cavite province south of Manila, June 12, 2018. Philippine President Rodrigo Duterte, in office now for two years, had put aside the sovereignty dispute to build relations with China and sidelined the United States. Analysts say Duterte is now seeking to renew relations with Washington because Philippine citizens, the armed forces and even members of the Cabinet favor a stronger maritime defense. China isn’t expected to give up on its friendship with the Southeast Asian archipelago, however, unless the joint exercises get bigger. “In recent months there has been a very subtle shift of attitude on the side of the Philippines, so I think this sort of move, to have joint exercises with the U.S., is in line with that,” said Oh Ei Sun, international studies instructor at Singapore Nanyang University. Sailors and fighter jets are seen on the deck of the U.S. aircraft carrier USS Ronald Reagan (CVN 76) as it anchors off Manila Bay for a goodwill visit, June 26, 2018, west of Manila, Philippines. Under Duterte, the annual joint Philippine-U.S. naval exercises have avoided the South China Sea, a venue picked by his predecessor for the same events. In December 2016, Duterte threatened to end a visiting-troops agreement with the United States. He was angry then about a U.S. foundation’s withholding of development aid over human rights concerns linked to the deadly Philippine campaign against illegal drugs. But members of the relatively weak Philippine armed forces have pushed Duterte for more U.S. engagement, experts say. Public opinion surveys indicate much of the public also supports a U.S. role for the Philippines. On Thursday, Philippine Vice President Leni Robredo gave a speech on “the importance of asserting the country’s rights over its territories,” her office said in a statement. Defense officials prefer the United States to China, said Maria Ela Atienza, a political science professor at the University of the Philippines Diliman. The two countries signed a mutual defense treaty in 1951 shortly after the United States ended its colonization of the archipelago. Washington sees the Philippines as part of a network of allies in East Asia. FILE - The BRP Gregorio Del Pilar Philippine warship, at Manila's pier, Philippines, Dec. 17, 2014. The warship is a refurbished former U.S. Coast Guard Hamilton-class weather high endurance cutter. The two navies are doing exercises this week to “increase proficiency in air” as well as missile defense, the Indo-Pacific Command website says. The so-called “Sama Sama” exercises also cover diving maneuvers and search-and-rescue operation. The Philippines is also trying to improve its navy overall, said Eduardo Araral, associate professor at the National University of Singapore’s public policy school. A naval inspection committee approved the design review for the two new frigates in March. 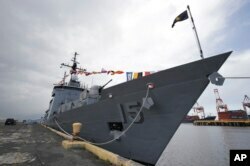 Another vessel, the BRP Andres Bonifacio, entered the navy two years ago after being decommissioned by the U.S. military. The Philippine government may need U.S. help in learning to operate the ships, Araral said. “The bigger picture is that the Philippines has not broken off with the U.S. military alliance, so you wouldn’t be surprised if in the future they will have infantry training, armed forces training, navy retraining, so on and so forth,” Araral said. China “won’t read too much” into this month’s U.S.-Philippine exercises as long as the activities avoid disputed islets, Araral said. Officials in Beijing would be more likely to object if the United States alone were carrying out the exercises, Atienza said. Washington does not have a claim to the South China Sea, which extends from Hong Kong south to the island of Borneo, but it regards the waterway as international and periodically sends vessels to counter growing Chinese maritime control. Brunei, Malaysia, the Philippines, Taiwan and Vietnam contest China on sovereignty over all or parts of the 3.5 million-square-kilometer South China Sea. All sides value the sea’s fisheries and fossil fuel reserves. Beijing has irked the other claimants by landfilling several islets for military use. But it has offered economic aid to much of Southeast Asia, including pledges of $24 billion to the Philippines, to ease that friction. Two years ago this month China lost a world arbitration court ruling to the Philippines over the legal basis for its maritime claims.